Fids are the perfect tools to use for finishing your paracord items. Use a set of fids when you near the end of your creation to "lace" the paracord through tiny holes. These tools should be everyone's paracording tool box. 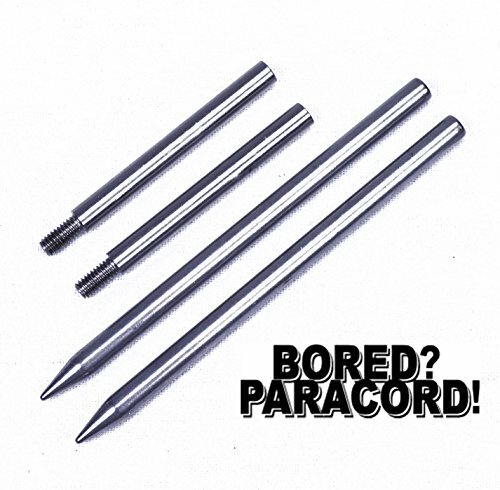 Fids / needles are manufactured from extremely high quality Stainless Steel. Simply melt your paracord into a small point. Then, spin the paracord into the threaded fids. When the paracord is seated correctly, it is nearly impossible to pull directly out. Works well with 425 cord, 550 cord, and similar size. If you have any questions about this product by BoredParacord, contact us by completing and submitting the form below. If you are looking for a specif part number, please include it with your message.